In the early 1970s, primatologists made the first modern scientific descriptions of culture among chimpanzees. It was a controversial observation: most scientists had regarded culture, or the transmission of knowledge between individuals through social learning, and its accumulation in communities distinguished by customs rather than genetics, as a uniquely human trait. Nowadays the existence of chimpanzee culture is accepted as fact — but chimp populations are endangered and fast-declining, and their cultures are vanishing before our eyes. Saving them will require a new approach to conservation. “We anticipate the necessity for a new concept, ‘chimpanzee cultural heritage sites’, with which the behavioral and cultural diversity of this species might be recognized and protected,” write primatologists in the journal Science. 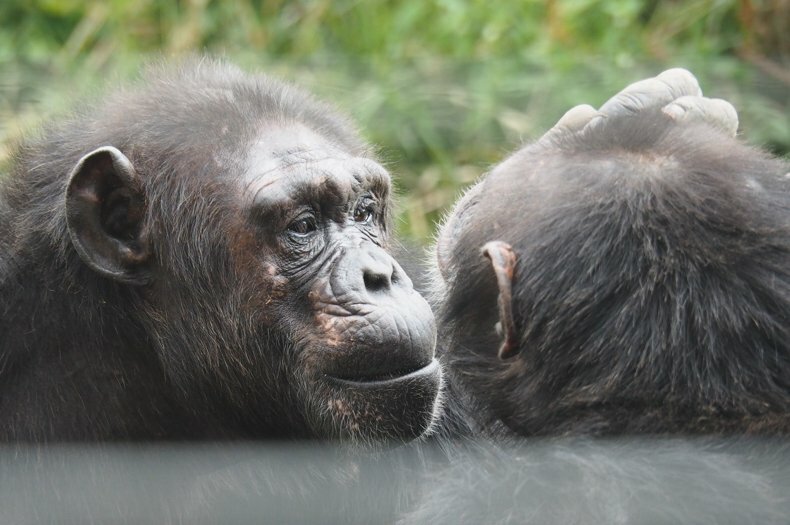 Led by by Hjalmar S. Kühl and Ammie Kalan of the Max Planck Institute for Evolutionary Anthropology, the researchers documented 31 cultural traits in 144 chimpanzee communities across central and western Africa. They found that as deforestation, killing, and habitat fragmentation increased, the chimps’ cultural repertoire decreased. Those impacts interrupt the transmission of knowledge. Especially knowledgeable or innovative individuals may be lost. There are fewer chimps for survivors to learn from. Where human impacts were greatest, the likelihood of any given article of culture — distinctive nest-building styles, bathing practices, the use of tools for hunting or honey-gathering, food preparation techniques, and so on — being present decreased by a whopping 88 percent. This isn’t just unfortunate in a philosophical sense, in the way that any dying culture is a sorrowful thing. Traditions may be vital to chimpanzee survival. With populations falling by several percent a year, the loss of knowledge further imperils them, and Kühl’s team calls for “maximal protection of behavioral variation.” Unique practices and chimp communities with exceptionally rich cultural repertoires urgently need attention. It’s an idea that applies not only to chimpanzees, but to a great many species for whom culturally transmitted knowledge is an important part of life. Elephants and orcas rely on the wisdom of clan matriarchs; the migration routes of many ungulates, birds, and even fish are learned rather than instinctive; on and on the examples go. The scientific study of animal culture has flourished — yet most conservation policymakers have been slow to embrace it. “Strategies and policies have focused primarily on broad demographic responses and the preservation of genetically defined, evolutionarily significant units,” write researchers led by Philippa Brakes of Whale and Dolphin Conservation in a commentary accompanying the chimpanzee study. Sources: Brakes et al. “Animal cultures matter for conservation.” Science, 2019. Kühl et al. “Human impact erodes chimpanzee behavioral diversity.” Science, 2019.